I absolutely adore Lauren Rowe, she is one of those authors that has the knack of delivering incredibly hot, heart-felt romances all the while having you in stitches with her trademark wit. This authors sense of humour is fantastic and never fails to give me a smile from ear to ear. 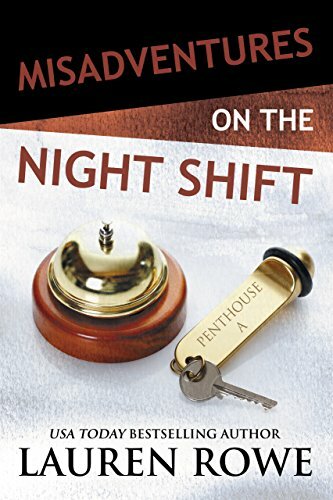 Misadventures on the Night Shift is a book I went into blind, I didn’t know what to expect, but loved what I got. Rockstar romance with a little hate/love thrown in for good measure. 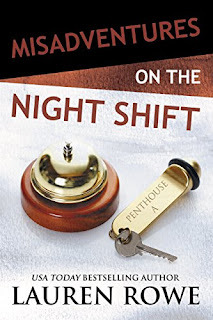 Abby is a law student by day and a hotel receptionist by night. Her job suits her fine as she manages to go to classes and with the night shift being dead, she can study at night too. Win, win situation as it pays the bills. Abby comes across in the first instance as conservative and quiet, but that is the “new” Abby. Abby had a past that she was keen to forget and never wanted to repeat, however, one late night check-in is her biggest test to date. Lucas Ford is the lead singer of one of the biggest boy bands. A band that Abby has followed for years and a lead singer that has been the main focus of her dreams and fantasies ever since. Lucas has had a mini breakdown; the record companies are stifling his creativity and have basically held him to ransom until he produces the music they want. They have holed him up in the hotel for a week so that he can write. But how can you write something you don’t want to? Abby and Lucas do not hit it off and the initial tension and the barbs that fly between these two had my head going back and forth, like watching a tennis match. With illusions shattered Abby tries to avoid Lucas like the plague, but since his sparring matches with her, it seems he becomes inspired and Lucas is not letting his muse escape. I loved that both these characters had a past and both were fighting their own demons. Their commonality and their love of music brought these two together and I did feel that their pairing was inspired. I felt sorry for Abby insofar as she felt the need to suppress her true self, however, was grateful that Lucas made the real Abby stand up. As I said, this book was extremely hot in places, adorable characters and a selfless hero that despite the persona he portrays was nothing like the man inside. Lucas was a stunning hero that captivated me from the very start. Another great read from Lauren Rowe.